In inflammatory processes, the p38 mitogen-activated protein kinase (MAPK) signal transduction route regulates production and expression of cytokines and other inflammatory mediators. Tumor necrosis factor α (TNF-α) is a pivotal cytokine in rheumatoid arthritis and its production in macrophages is under control of the p38 MAPK route. Inhibition of the p38 MAPK route may inhibit production not only of TNF-α, but also of other inflammatory mediators produced by macrophages, and indirectly of inflammatory mediators by other cells induced by TNF-α stimulation. Here we investigate the effects of RWJ 67657, a p38 MAPK inhibitor, on mRNA expression and protein production of TNF-α and other inflammatory mediators, in monocyte-derived macrophages. A strong inhibition of TNF-α was seen at pharmacologically relevant concentrations of RWJ 67657, but also inhibition of mRNA expression of IL-1β, IL-8, and cyclooxygenase-2 was shown. Furthermore, it was shown that monocyte-derived macrophages have a high constitutive production of matrix metalloproteinase 9, which is not affected by p38 MAPK inhibition. The results presented here may have important implications for the treatment of rheumatoid arthritis. Rheumatoid arthritis (RA) is characterized by chronic inflammation of synovial tissue and destruction of cartilage and bone in the joints . Macrophages play an important role in RA, as the rheumatoid synovium is intensively infiltrated by macrophages and their numbers correlate with clinical scores  and articular destruction in RA . RA patients with active disease display a faster generation of CD14+ myelomonocytic cells from the bone marrow and faster differentiation into HLA-DR+ cells than control individuals do . Activation of the monocytic lineage in inflammatory disease is not restricted to synovial macrophages, but extends to circulating monocytes and other cells of the mononuclear phagocyte system . The activation state of monocytes/macrophages is characterized by increased expression and transcription of interleukin (IL)-1β and tumor necrosis factor α (TNF-α), but also of other proinflammatory and regulatory cytokines and growth factors . Highly specific therapeutics have been developed to target these cytokines, such as monoclonal antibodies, soluble receptors, binding proteins, and receptor antagonists. TNF-α blockade has been the major breakthrough in the therapy of RA during the past 10 years. However, more than half of patients do not achieve adequate responses, remissions are rare, and these drugs do have side effects [7, 8]. The importance of mitogen-activated protein kinases (MAPKs) in cell biology has been reported in many studies concerning different inflammatory diseases. These MAPKs belong to three families: the extracellular signal-regulated kinases (ERKs); the c-Jun N-terminal or stress-activated protein kinases (JNK/SAPKs); and the p38 MAPKs. All three families have been shown to become activated in macrophages in response to a variety of stimuli both in primary cells and in cell lines . In the RA synovium, p38 MAPK is predominantly activated in endothelial cells and in the lining layer . Inhibition of p38 MAPK therefore could provide an interesting target for intervention in inflammation, as it occurs in the synovia in RA. In vitro stimulation of macrophages with lipopolysaccharide (LPS) leads to activation of MAPK cascades through the LPS receptor (CD14) or Toll-like receptors . The ability of bacterial toxins or super-antigens to induce proinflammatory responses leading to the production of TNF-α and IL-1 is relevant in view of the possible microorganism etiology in RA . Stimulation of monocytes with LPS induces a number of matrix metalloproteinases (MMPs), including two prominent monocytic MMPs: interstitial collagenase (MMP1) and gelatinase B (MMP9). These enzymes are involved in the connective-tissue loss associated with chronic inflammatory diseases. In vivo, a significant part of macrophage effector responses occurs through cell-contact-dependent signalling with several inflammatory cells, mainly T cells and fibroblasts. A few soluble stimuli, such as IL-15 and IL-17, are known to have a stimulatory effect on macrophages. It has also been reported that IL-17 induces the production of MMP9 and cyclooxygenase-2 (COX-2), which is the rate-limiting enzyme in prostaglandin and leukotriene synthesis in monocytes/macrophages . The p38 MAPK inhibitor RWJ 67657 (4-[4-(4-fluorophenyl)-1-(3-phenylpropyl)-5-(4-pyridinyl)-1H-imidazol-2-yl]-3-butyn-1-ol) has been shown to inhibit the release of TNF-α from LPS-treated human peripheral blood mononuclear cells, with a median inhibitory concentration (IC50) of 3 nM . Moreover, this compound effectively inhibited endotoxin-induced clinical effects and cytokine release in normal healthy volunteers . Furthermore a report was published in which pharmacokinetics and pharmacodynamics of RWJ 67657 were presented, showing that the compound has acceptable safety to warrant further investigation . Our group recently showed that RWJ 67657 significantly inhibited IL-6, IL-8, MMP3, and COX-2 mRNA expressed by IL-1β and/or TNF-α stimulated rheumatoid synovial fibroblasts . It has been shown that differences occur in signalling pathways in myeloid cells in relation to the maturation stage of macrophages . Strong inhibition of TNF-α in monocytes has been reported due to p38 MAPK inhibition , but the effects in matured macrophages are not fully known. Therefore in this study we investigated the effects of the p38 MAPK inhibitor RWJ 67657 on the mRNA expression and production of inflammatory cytokines and MMPs by stimulated monocyte-derived macrophages (MDMs). We investigated macrophages, differentiated in medium with pooled serum or by the method described by Plesner and co-workers , and compared MDMs from healthy controls and RA patients. Strong inhibition of mRNA expression and production of TNF-α by RWJ 67657 was found, as well as inhibition of IL-1β, IL-8, and COX-2 mRNA expression. RWJ 67657 was provided by Johnson and Johnson (RW Johnson Pharmaceutical Research Institute, Raritan, NJ, USA). Antibodies for flow cytometry were obtained from IQProducts, Groningen, the Netherlands. LPS was purchased from Sigma-Aldrich (Zwijndrecht, the Netherlands). Recombinant human macrophage-colony-stimulating factor (M-CSF) and ELISA antibodies were from R&D Systems (Minneapolis, MN, USA). Fetal calf serum (FCS) and RPMI 1640 culture medium were obtained from Biowhittaker (Verviers, Belgium). All reagents for RNA isolation and reverse transcriptase reaction were purchased from Invitrogen, Life Technologies (Gaithersburg, MD, USA). Reagents for real-time RT-PCR were obtained from Applied Biosystems (Foster City, CA, USA). Specific antibodies to p38 MAPK, phospho-p38 MAPK, and phospho-MAPKAPK-2 were purchased from Cell Signalling Technologies (Beverly, MA, USA) and detecting antibody peroxidase-swine-anti-rabbit was from DAKO (Glostrup, Denmark). Blood was obtained from RA patients who had given their informed consent and from healthy laboratory workers. Peripheral mononuclear cells were isolated by Lymphoprep density-gradient centrifugation from citrated blood. Cells were suspended in RPMI with gentamicin at 106 cells/ml and seeded in 6-well plates (Costar, Badhoevedorp, the Netherlands) in 3 ml or 0.5 ml into 24-well plates and cultured at 37°C in a 5% CO2 atmosphere. After 2 hours, nonadherent cells were discarded and adherent monocytes were allowed to differentiate into macrophages in RPMI containing gentamicin, 50 ng/ml M-CSF + 1% FCS ; medium was refreshed at day 2. To compare methods, monocytes were also differentiated in RPMI with gentamicin + 2% pooled human serum; on days 2 and 5, fresh medium was added to the wells. Cells were cultured for 5 or 7 days. We found no marked differences between differentiation methods and decided to perform further experiments with macrophages differentiated with M-CSF and FCS. Expression of surface markers CD14 (LPS receptor), HLA-DR, CD18 (β2 integrin subunit), CD36 (GPIIIb, GPIV), and CD83 (dendritic cell marker) on monocytes in the peripheral blood mononuclear cell fraction and on differentiated macrophages was detected by flow cytometric analysis in an Epics-Elite flow cytometer (Coulter Electronics, Mijdrecht, the Netherlands). 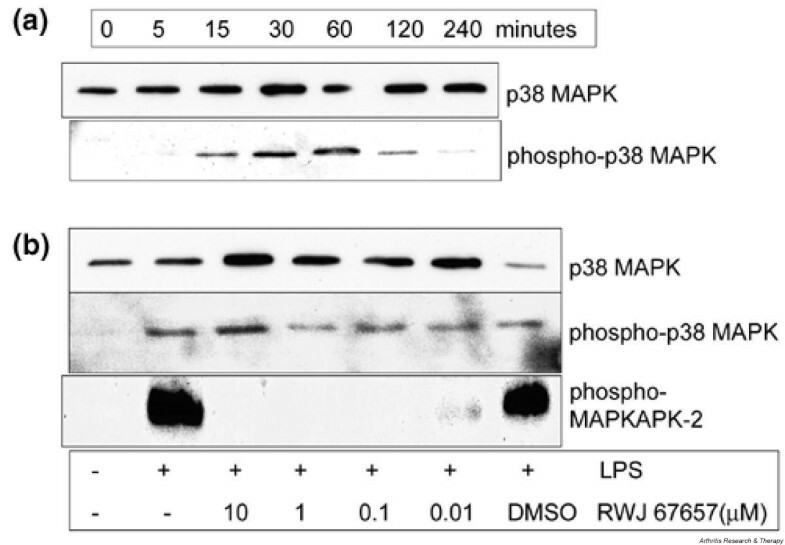 Phosphorylation of p38 MAPK in MDMs was analyzed by western blotting. Cells were cultured in RPMI containing gentamicin, 50 ng/ml M-CSF + 1% FCS for 5 days and stimulated with 50 ng/ml LPS for various periods of time. Cell extracts were prepared by lysing the cells with 1 × SDS sample buffer (containing 2% SDS, 10% glycerol, 50 mM dithiothreitol, 62.5 mM Tris–HCl [pH 6.8], and 0.01% bromphenol blue). Cells were scraped off the wells and the lysates were subsequently sonicated for 5 to 10 seconds and boiled for 5 minutes. After centrifugation, the samples were loaded onto a 10% SDS–PAGE gel and resolved by running at a constant 200 V and 15 W. Semidry blotting was performed onto nitrocellulose membrane and immunodetection was with anti-phospho-p38 MAPK and peroxidase-anti-rabbit. Enhanced chemiluminescence detection was performed in accordance with the manufacturer's guidelines (Lumi-Lightplus, Roche Diagnostics, Mannheim, Germany). To determine the effect of RWJ 67657 on phosphorylation of p38 MAPK and its downstream substrate MAPK-activating protein kinase-2 (MAPKAPK-2), a concentration range of the p38 MAPK inhibitor (0, 0.01, 0.1, 1, and 10 μM) was added 1 hour before stimulation with 50 ng/ml LPS for 30 minutes. Blotting experiments were performed with specific antibodies to p38 MAPK, phospho-p38 MAPK, and phospho-MAPKAPK-2. MDMs from eight healthy controls and nine RA patients, who were not treated with steroids, were cultured in 24-well plates in RPMI containing gentamicin, 50 ng/ml M-CSF + 1% FCS for 5 days. The cells were subsequently pretreated with increasing concentrations of RWJ 67657 (stock solution 10 mM in dimethyl sulfoxide [DMSO]), from 0.01 μM to 10 μM for 1 hour prior to stimulation with 50 ng/ml LPS for 24 hours. Levels of cytokines (TNF-α, IL-1β, IL-6, and IL-8), MMP1, MMP9, and tissue inhibitor of metalloproteinases (TIMP)-1 were measured in cell supernatants by ELISA, using matched antibody pairs for ELISA and recombinant proteins as standards from R&D Systems. Detection limits for all cytokine ELISAs was 20 pg/ml. For optimal determination of MMP1, MMP9, and TIMP-1, 96-well plates (Greiner M129A) were precoated with F(ab)2 fragments of goat-anti-mouse IgG-Fc (Jackson, West Grove, PA, USA) in 0.1 M carbonate buffer (pH 9.6) for at least 48 hours before coating of the capture antibody. After sample incubation and binding of the biotinylated detection antibodies, the color reaction was performed with streptavidin-poly-horseradish peroxidase (Sanquin, Amsterdam, The Netherlands) and tetramethylbenzidine (TMB; Roth, Karlsruhe, Germany). The detection limit for MMP1 and TIMP-1 was 1 ng/ml and for MMP9, 0.1 ng/ml. MDMs from healthy controls were cultured in 6-well plates in RPMI containing gentamicin, 50 ng/ml M-CSF + 1% FCS for 5 days. First, macrophages were stimulated with 50 ng/ml LPS for various periods of time to determine optimal mRNA expression of TNF-α, IL-1β, IL-6, IL-8, MMP9, and COX-2 genes. At the optimal time point, the effect of p38 MAPK inhibition on LPS-stimulated MDMs was determined by pretreatment of the cells with increasing concentrations of RWJ 67657 for 1 hour. Total RNA was isolated from the cells with TRIZOL reagent in accordance with the manufacturer's instructions (Life Technologies). After DNAse treatment (Ambion DNA-free, Austin, TX, USA) cDNA was synthesized from 1.0 μg of total RNA using M-MLV Reverse Transcriptase and oligo (dT)24 (Life Technologies). For detection of mRNA expression, a fluorescence-based real-time RT-PCR was performed, which allows relative quantification of steady-state mRNA. The amount of emitted fluorescence is proportional to the amount of PCR product and enables the monitoring of the PCR reaction. For the measurement of IL-1β, TNF-α, IL-6, IL-8, MMP9, COX-2, and glyceraldehyde-3-phosphate dehydrogenase (GAPDH), 1 μl of cDNA in triplicate was used for amplification by the real-time quantitative PCR system (ABI Prism 7900HT Sequence Detection System, Applied Biosystems) with specific Taqman primers/probes. The Assay-on-Demand numbers for the genes were as follows: IL-1β, Hs00174097_m1; TNF-α, Hs00174128_m1; IL-6, Hs00174131_m1; IL-8, Hs00174103_m1; MMP9, Hs00234579_m1; COX-2, Hs00153133_m1 and GAPDH, Hs99999905_m1. The amount of target, normalized to an endogenous reference (GAPDH) and relative to a control sample, is given by 2-ΔΔCT, in which CT is the threshold cycle. The results are expressed as fold induction relative to untreated samples. Paired t-tests were performed using GraphPad Prism version 3.00 for Windows, GraphPad Software (San Diego, CA, USA). Expression of surface markers on monocytes and macrophages was measured by flow cytometry. In Fig. 1, the mean fluorescence intensity (MFI) of CD14 and HLA-DR on monocytes (left panel) and macrophages differentiated in 50 ng/ml M-CSF and 1% FCS after 5 days (right panel) is shown, versus the number of cells measured in the flow cytometer. Macrophages differentiated in this way showed lower expression of CD14 than monocytes, relative to the isotype control, whereas the HLA-DR expression did not differ between the two cell types. Expression of CD18 increased with differentiation, while expression of CD36 decreased (data not shown). Expression of CD83 was not seen on matured macrophages, excluding differentiation into dendritic cells. For further experiments, monocytes differentiated in medium with 50 ng/ml M-CSF and 1% FCS for 5 days were used. Expression of CD14 (bold grey line) and HLA-DR (bold black line) in monocytes (left panel) and macrophages, differentiated with 50 ng/ml macrophage-colony-stimulating factor and 1% FCS after 5 days (right panel), measured by flow cytometry and expressed in mean fluorescence intensity (MFI). The isotype control is an IgG2a antibody (dashed line); the blank is in solid fill. The MFI is shown on the x-axis, while on the y-axis the number of cells measured in the flow cytometer is expressed. PE = phycoerythrin. In Fig. 2a, a representative example is shown of phosphorylation of p38 MAPK in MDMs after stimulation with 50 ng/ml LPS. Phosphorylation occurs after 15 minutes, is maximal at 30–60 minutes, and diminishes after 2 hours. p38 MAPK is constitutively expressed in the cells, as is demonstrated in the control blot. The effect of RWJ 67657 on phosphorylation of p38 MAPK and its direct downstream substrate, MAPKAPK-2, measured after 30 minutes of stimulation with 50 ng/ml LPS, is shown in Fig. 2b. 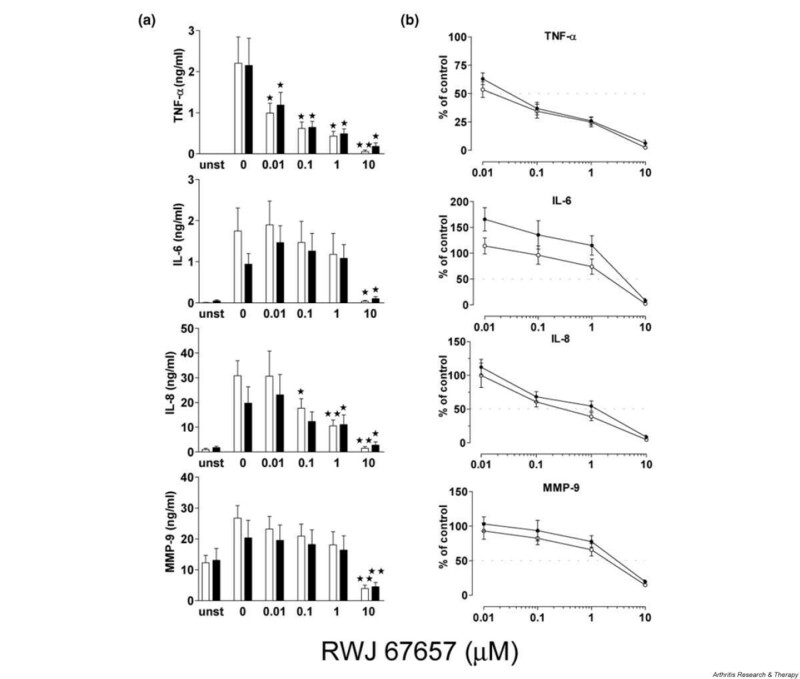 RWJ 67657 does not inhibit phosphorylation of p38 MAPK but does inhibit its activity, as can be seen from the strong inhibition at 0.01 μM and the complete inhibition of MAPKAPK-2 phosphorylation at 0.1 μM RWJ 67657. The solvent, 0.1% DMSO, did not affect phosphorylation of either kinase. Effect of RWJ 67657 on phosphorylation of p38 MAPK and MAPKAPK-2. (a) Representative presentation of phosphorylation of p38 mitogen-activated protein kinase (MAPK) in monocyte-derived macrophages after stimulation with lipopolysaccharide (LPS) at various time points. Phosphorylation was measured by western blotting using specific antibodies to p38 MAPK and phospho-p38 MAPK. (b) Effect of RWJ 67657 on phosphorylation of the direct substrate of p38 MAPK, MAPKAPK-2 (MAPK-activating protein kinase-2), measured after 30 minutes of stimulation. DMSO = dimethyl sulfoxide. 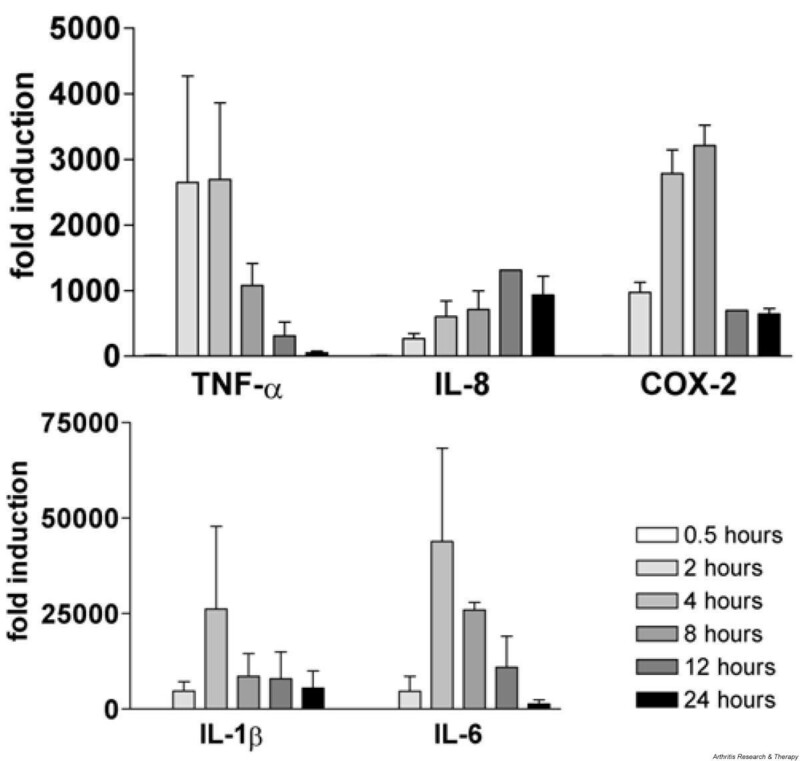 Stimulation of MDMs with 50 ng/ml LPS for 24 hours resulted in increased production of TNF-α, IL-6, IL-8, and MMP9 both in control macrophages and in RA macrophages (Fig. 3a). Production of IL-1β, MMP1, and TIMP-1 was too low for detection. Before stimulation, TNF-α production was below the detection limit, while after stimulation, the mean production in control MDMs was 2.204 (± 1.993) ng/ml and 2.150 (± 1.816) ng/ml in RA MDMs. Protein production of tumor necrosis factor (TNF)-α, IL-6, IL-8, and matrix metalloproteinase 9 (MMP9) by monocyte-derived macrophages from healthy controls (n = 8, open squares) and rheumatoid arthritis patients (n = 9, filled squares). Cells were stimulated with LPS for 24 hours and pretreated 1 hour beforehand with RWJ 67657 at various concentrations. Protein production was measured in supernatants by ELISA and is expressed in ng/ml (a). Inhibition was calculated against the stimulated control (b). Bars show mean and SEM. *P < 0.05; **P < 0.001, paired t-test, calculated versus the stimulated control. unst, unstimulated. Pretreatment of the macrophages with increasing concentrations of RWJ 67657 showed a dose-dependent decrease of protein production for TNF-α and IL-8. Inhibition of TNF-α production was seen, with an IC50 of 0.015 μM for control cells and 0.03 μM for RA cells (Fig. 3b). For IL-8 production, the IC50 was 0.3 μM for control cells and 1.2 μM for RA cells. IL-6 and MMP9 production was inhibited only at concentrations between 1 and 10 μM RWJ 67657. Pretreatment of MDMs with 0.1% DMSO had no significant effect on protein production (data not shown). To determine optimal stimulation time points for the genes involved in this study, MDMs of two healthy control subjects were stimulated for 0.5, 2, 4, 8, 12, and 24 hours with 50 ng/ml LPS. mRNA expression of TNF-α, IL-1β, IL-6, IL-8, and COX-2 was measured with real-time RT-PCR, as depicted in Fig. 4. A significant increase in mRNA expression of all but MMP9 was found after stimulation with LPS. After 4 and 8 hours of stimulation, most genes were highly expressed. IL-8 mRNA expression was still increased after 12 and 24 hours. For measurement of the effects of the p38 MAPK inhibitor, MDMs were stimulated for 4 hours. Time course of induction of mRNA expression of tumor necrosis factor (TNF)-α, IL-1β, IL-6, IL-8, and cyclooxygenase 2 (COX-2). Monocyte-derived macrophages from healthy controls (n = 2) were stimulated for increasing periods of time with lipopolysaccharide (50 ng/ml). mRNA expression was determined with real-time RT-PCR and results were calculated as fold induction in comparison with unstimulated cells (fold induction = 1). As can be seen in Fig. 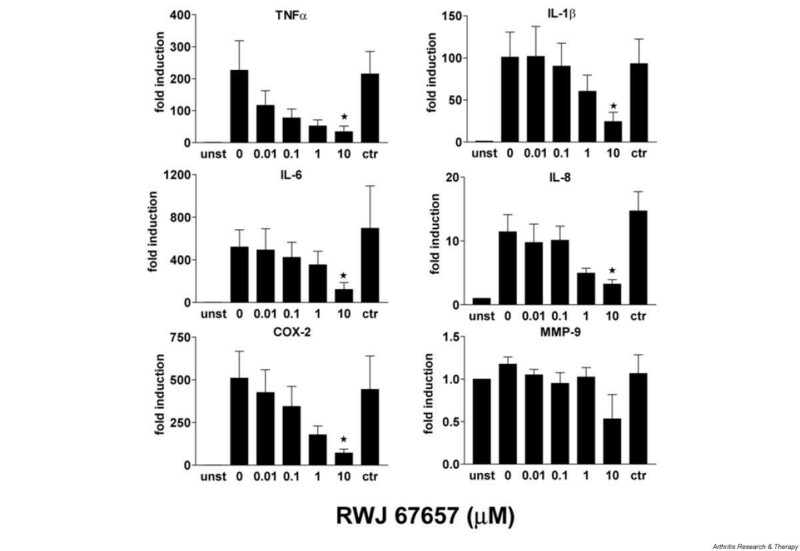 5, there is a dose-dependent decrease in mRNA expression with increasing RWJ 67657 concentration. TNF-α mRNA expression is inhibited by 48.4% at 0.01 μM and 65.8% at 0.1 μM p38 MAPK inhibitor. IL-1β, IL-8, and COX-2 mRNA expression was reduced by 40.2%, 56.6%, and 65.0%, respectively, at 1 μM. MMP9 mRNA expression is not induced and not inhibited and proved to be constitutively expressed at a high level. Control incubations with 0.1% DMSO had no significant effect on mRNA expression, as can been seen in Fig. 5.
mRNA expression of tumor necrosis factor (TNF)-α, IL-1β, cyclooxygenase 2 (COX-2), IL-6, IL-8, and matrix metalloproteinase 9 (MMP9) in monocyte-derived macrophages from healthy controls (n = 5). Cells were stimulated with lipopolysaccharide for 4 hours and pretreated with a RWJ 67657 at various concentrations. mRNA expression was determined with real-time RT-PCR and results are expressed as fold induction in comparison with unstimulated cells (fold induction = 1). Bars show means and SEM (*P < 0.05, paired t-test, calculated against the stimulated control). In this study, we have shown the significant inhibition of TNF-α production in MDMs by the p38 MAPK inhibitor RWJ 67657. The strong inhibition was seen at the level of both mRNA expression and protein production, so inhibition is already apparent at the level of transcription. p38 MAPK activity in RA is found predominantly in the synovial lining layer and in endothelial cells in the synovium . The lining layer consists mainly of fibroblasts and macrophages, both important players in the process of inflammation by the production of cytokines and degrading enzymes. Recently our group demonstrated strong inhibition of IL-6, IL-8, COX-2, and MMP3 expression in rheumatoid synovial fibroblasts by the p38 MAPK inhibitor RWJ 67657 . Studying macrophages in vitro raises some difficulties, because isolation and culture of macrophages from synovial tissue is disturbed by the overgrowth of fibroblasts. Therefore, macrophages differentiated from peripheral blood monocytes are widely used for in vitro studies. By using M-CSF and low FCS concentrations, we generated macrophages with high HLA-DR expression that were not activated . Current treatment strategies in RA, including TNF-α- and IL-1-blocking agents, alone or in combination with, for example, methotrexate, still have limited efficacy in a substantial proportion of patients. Recently, Redlich and co-workers reviewed the multiple pathogenesis pathways involved in RA, and the possible targets for therapies, and stressed the importance of aiming at interference both with the pathways leading to inflammation and with those ultimately leading to destruction . Inhibition of signal transduction cascades may fit in this concept, because they are involved in the activation of proinflammatory cytokines as well as of MMP genes. The p38 MAPK inhibitor RWJ 67657 has been reported to be specific for p38 α and β, and has no activity for other kinases . The first study investigating the pharmacokinetics and pharmacodynamics of RWJ 67657 to be done in humans showed that a single oral intake of 0.25 ranging up to 30 mg/kg resulted in plasma levels of 0.01 μM to 6 μM . Furthermore, the study showed that at the doses tested there were no significant adverse effects. p38 MAPK acts mainly through phosphorylation of its downstream substrate, MAPKAPK-2, and a variety of transcription factors . Mice that lack MAPKAPK-2 show increased stress resistance and survive LPS-induced endotoxic shock, due to a 90% reduction in the production of TNF-α . The level and stability of TNF-α mRNA was not reduced in these mice, so the inhibition was at the post-transcriptional level. With western blotting, we demonstrated complete inhibition of phosphorylation of MAPKAPK-2 at 0.1 μM RWJ 67657, and strong inhibition at 0.01 μM. In our study, TNF-α production was significantly inhibited at nanomolar concentrations of RWJ 67657, and mRNA expression was also decreased, by nearly 50% at 10 nM. Inhibition of p38 MAPK activity leads to reduced TNF-α mRNA expression and therefore reduced TNF-α production, while inhibition of MAPKAPK-2, as in MAPKAPK-2 knockout mice, leads to reduced TNF-α production without affecting the mRNA levels. IL-6 production and mRNA expression were not inhibited by p38 MAPK inhibition, but IL-8 production and mRNA expression were inhibited by more than 50% at 1 μM RWJ 67657. Bhattacharyya and co-workers showed that LPS from Helicobacter pylori stimulates IL-8 release from cells of the monocytic lineage through activation of NF-κB and MAPK cascades , and we demonstrated that in MDMs the p38 MAPK route plays an important role in this process. In 1992, Herzyk and co-workers published findings showing that macrophage and monocyte IL-1β regulation differs at multiple sites . Macrophages did not differ from monocytes in LPS sensitivity but had limitations in IL-1β release. Our study shows mRNA expression of IL-1β in MDMs, as well as a reduction of mRNA expression at 1 μM RWJ 67657, but protein production in MDMs was below the detection limit of the measurement. We found a reduction of 65% in COX-2 mRNA expression after treatment with 1 μM RWJ 67657. It was previously demonstrated that p38 MAPK plays a role in transcription and stabilization of COX-2 mRNA . However, Caivano and Cohen showed that both p38 MAPK and ERK influence COX-2 mRNA expression through activation of mitogen- and stress-activated protein kinase 1 (MSK-1) , an activator of important transcription factors such as activating transcription factor (ATF)-2 and cyclic AMP response element binding protein (CREB). Our results indicate an important role for p38 MAPK in COX-2 mRNA expression in MDMs. In synovial tissue, the presence of macrophages is often seen together with the expression of MMPs and TIMP-1 . In our study, MMP1 and TIMP-1 could not be detected in the cell supernatants of MDMs after LPS stimulation, in contrast to high production of MMP9. MMP9 is associated with macrophages and peripheral blood mononuclear cells and has a broad substrate specificity and may contribute together with collagenases to the degradation of fibrillar collagens, basement membrane components, and stromal extracellular matrix molecules . Stimulation with LPS induced a twofold induction of MMP9 levels, which was not inhibited by pretreatment with RWJ 67657 at low concentrations. Also, mRNA expression of MMP9 could not be induced by LPS stimulation, and no inhibition by p38 MAPK inhibitor was observed. This latter finding is in accordance with the study by Lai and co-workers showing that LPS induction of MMP9 in monocytes is mainly regulated by the ERK1/2 pathway and not the p38 MAPK pathway . p38 MAPK inhibitors have effects on various cell types, thereby possibly enhancing the therapeutic effects but also increasing the risk of side effects. One of the reasons for undesirable effects might be the cross-reactivity against other kinases, which is not the case for RWJ 67657 . The preliminary pharmacokinetic data suggest a twice-daily dosing regimen , while our data show significant effects at low concentrations. A significant inhibition of TNF-α production and mRNA expression in LPS-stimulated MDMs was observed after pretreatment with RWJ 67657, a p38 MAPK inhibitor, at pharmacologically relevant concentrations. Inhibition of mRNA expression of IL-1β, IL-8, and COX-2 was also detected. MMP9 was found to be constitutively produced at high levels and not inhibited by RWJ 67657. The results presented here could have important implications for the treatment of RA, since the drug used in this study has already proved to be safe in a study in humans . More research into the effects of p38 MAPK inhibition on other cell types involved in inflammation should establish its applicability as a drug in the near future. This work was supported by the Dutch Rheumatology Foundation and Johnson and Johnson Pharmaceutical Research and Development, Raritan, NJ, USA. Part of this study was financed by an unrestricted grant from Johnson and Johnson Pharmaceutical Research and Development, Raritan, NJ, USA. One of the authors (PdB) is an employee of this company.